Fashionable Crochet - patterns, yarns and advice. Welcome to CrochetBrain.co.uk. We love modern crochet and want to share that enthusiasm with you. We'll be keeping you posted on the latest crochet products, new crochet yarns and crochet threads. We'll also be reviewing the latest crochet books and giving you advice on how to overcome common crochet problems such as yarn substitutions. For a bit of fun, why not take our crocheter's personality test to see what your strengths and weaknesses are and to get ideas of new things to try based on your personality profile. After all your hard work, keep your crochet in good condition and safe from bugs that eat yarn, see our crochet care section for more details. Be bold with big scarves, cowls and ponchos. Bright stripes will brighten up your winter wardrobe. Cashmere is aslo featuring heavily in high street accessories. Treat yourself to a luxury yarn. 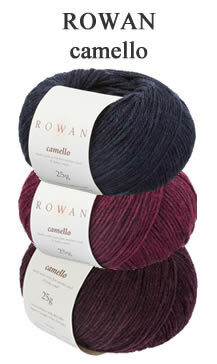 If your purse doesn't stretch to cashmere try Rowan Camello. Your crochet will have the feel of a luxury fine yarn. The chainette structure allows it to be crocheted as dk yarn because the yarn plumps up after washing. It comes in 10 shades with a subtle colour variations to give extra visual interest. Grab it while you can because it's a limited edition yarn. Flower Looms are the latest quick fix for crochet fans. They're a great way of adding a novel twist to your crochet projects. 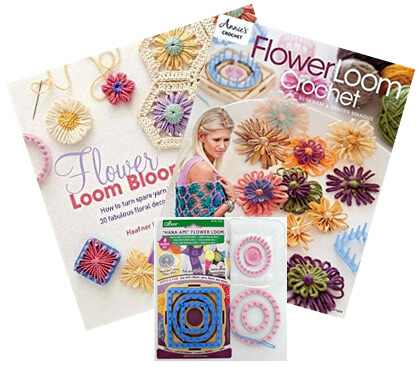 Flower Loom Blooms are simple to make and are ideal for using up leftover yarn. Click here to find out more and to buy your copy. The sets are available in either a pink or lime green case. 9 hooks from 2mm to 6mm. An investment you will enjoy for years to come. 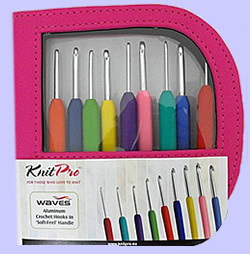 This crochet hook set would also make a perfect gift for any keen crocheter.